HORSHAM, PA--(Marketwired - Dec 3, 2013) - A torsion tester is a machine that twists a material specimen, such as an iron bar, to measure ultimate torque, but also continuous or intermittent torque loading in both directions of rotation. The 2013 version of a torsion tester from Tinius Olsen features a standard capacity of up to 300,000 in.lbf (higher for custom requirements), loading and weighing capabilities in both directions, a variable speed drive loading system, and a digital control and indicating system. While the new machine is equipped with latest technology, it would be very difficult to improve upon the company's 1965 version of a torsion tester, according to the Mechanical Engineering & Mechanics Department of Lehigh University's PC Rossin College of Engineering & Applied Science. That's because the school has been continuously using that machine in its lab, trouble-free, for just shy of five decades. "This 10,000 in.lbf tester is bullet proof. It has been in regular operation in Lehigh's lab since 1965 with no mechanical failures," states Tim Nixon, Engineering Technician at the Mechanical Engineering & Mechanics department. "Even routine service needs have been rare. Several months ago, the machine developed a gear box oil leak, not surprisingly, given that we never had to change a vacuum tube or other component in the original GE Thymotorol DC motor drive since we purchased the machine. About the only work done previously was to have our machine shop make new clamping jaws a few years ago, because the others had worn." According to Nixon, Lehigh plans for continued service for its torsion tester in 2014, following repair of the gear box seals and installation of a new variable speed AC motor drive. 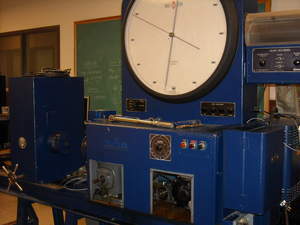 The lab also owns a Tinius Olsen Izod/Charpy Impact machine that is totally mechanical and newer than its 1965 torsion tester. "Tinius Olsen is always glad to hear of these longevity success stories, especially when they occur at a preeminent research institution like Lehigh University," notes Joe Sherlock, Vice-President of Sales. "Current bragging rights for the oldest Tinius Olsen testing machine still in daily operation belong to our Indian agents, who identified one of our 'Little Giant' tension and compression testers at Anna University in Chennai. It was made in 1908 and is still being used, but it was made before electricity was commercially available and hence is a lot less complicated of an operating system." Tinius Olsen is a global provider of materials testing solutions (equipment, software, and calibration services) with over 130 years of testing experience. For more information, contact: Tinius Olsen, 1065 Easton Road, Horsham, PA 19044 USA, (215) 675-7100, Fax (215) 441-0899, www.TiniusOlsen.com. 1965 era Torsion Tester from Tinius Olsen is still going strong in Lehigh University's Mechanical Engineering & Mechanics Department.